This year we do care the connection between other iGEM teams, especially with iGEM teams in other country. We don't know about each other, and we have very less opportunity to talk so we are willing to know each other. We helped iGEM Paris-Saclay, iGEM York, Virginia iGEM with their international survey. We talked a lot on twitter. 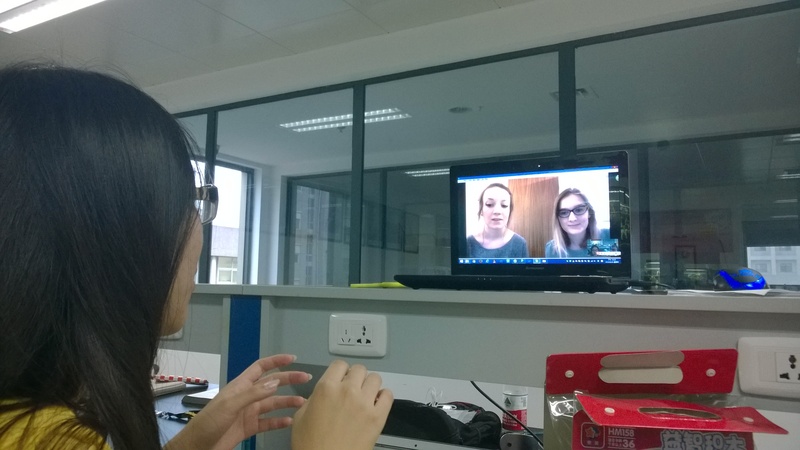 Skyping with iGEM york talked about the human practice and something about the project. 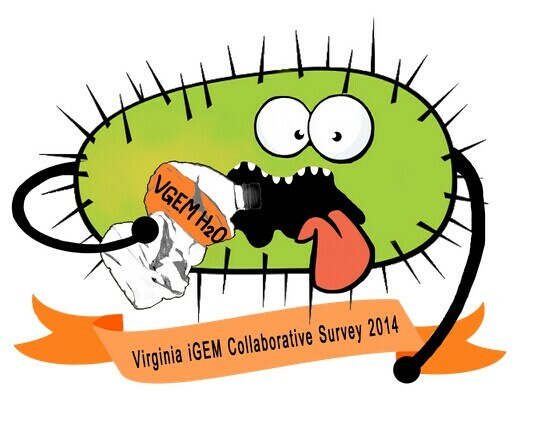 We even get the badge from Virginia iGEM. iGEM encourages the communication between teams and help others. So, when we heard HUST-China has something wrong about their promoter, we decided to give a hand. The one problem they had is they tried many times but failed to sequence those promoters in pET28a, and the other is they put mRFP under the promoter to do a promoter test but didn’t get result. So we got pCusC & PpcoA promoters with mRFP from them. We designed the 5’-agatcgggctcgccacttcg-3’ as the reverse primer to sequence the promoters. And Tsing Ke Biology Technology Company helped us synthetize the primer and sequence those plasmids. Analyzed the sample pCusC’s sequencing result, we found that the T7 promoter has not be digested , there is no pCusC in the plasmid, but mRFP has successful ligated. So the red color we observed was the red fluorescent protein expressed by the T7 promoter. Therefore, in the subsequent promoter test, we abandoned the pCusC samples. In the PpcoA samples we successfully found PpcoA and mRFP. However, at the end of PpcoA's sequencing result, there is more 6bp than HUST’s sequence. We took PpcoA promoter to detection. a. Add 2mL LB culture medium, 2uL Kanamycin (50mg/L) and 20uL bacterial samples to a 5mL centrifuge tube. Shaken overnight in the 37°C shaking incubator and set the rotational speed at 180 rpm/min. b. Add CuSO4 solution to induce in concentration of 0, 0.02, 0.1 and 1mM. Set three copies for each concentration as repetitions. Cultivate in the 37°C shaking incubator at the rotational speed of 180 rpm/min for 4 hours. c. Add 200uL bacterial samples from each centrifuge tube to the 96-well plate. Set two copies for each centrifuge tub as repetitions. Meanwhile, add LB culture medium containing and not containing 1.0mM CuSO4 as blank controls. d. Read the OD600 and fluorescent intensity (with the emission wavelength at 607nM and excitation wavelength at 584nM) using a multifunctional microplate reader. e. Divided the fluorescent intensity result using the value of OD600. Record the data for compare and analysis. When we added the 1.0mM Cu to bacterium solution，we observed the color change of the visible to the naked eye. So we tried to test the 1.0mM Cu in LB medium. Then we found its fluorescence value and the value of OD600 with only LB medium samples differred greatly. So we decided to use the 1.0mM Cu in LB medium as the blank samples of the 1.0mM control. We can observe from the figure, when the copper ion concentration is range of 0-0.1mM, with the increase of concentration of copper ion, promoter strength increased. 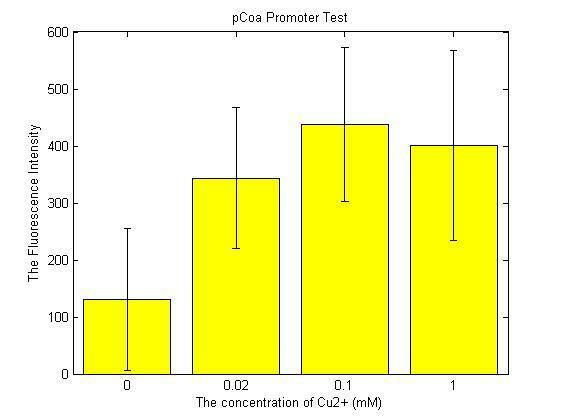 In the copper ion concentration of 1mM, the promoter strength decreased.